Have you ever wondered why change is so difficult? You read self-help books, (try to) monitor your thoughts, meditate and examine the intentions behind your actions, but you haven’t realized big movement in your life. Sometimes it may even appear as though certain situations will simply never fade from your daily experience. It has been estimated that the average person thinks anywhere from 60,000–70,000 thoughts a day, with 90% being the same thoughts as the day before. That’s a lot of thinking. It’s also a staggering amount of repetition. The same thoughts equal the same choices and the same choices equal the same actions, and of course, the same actions equal the same life experiences…over and over again. The truth of the matter is, if you want to see change in your life, you literally have to think new thoughts. You have to believe something different. There is no way around it. Believe me I’ve tried. Creating new thought patterns is by no means for the faint of heart. However, it can be done. There are lots of people who have changed the way they think, what they believe and how they perceive the world. These people, who we’d all like to tell ourselves that they’re in some way special or different than the average person, really aren’t that different at all. What they do differently is, they believe things that most people don’t believe. 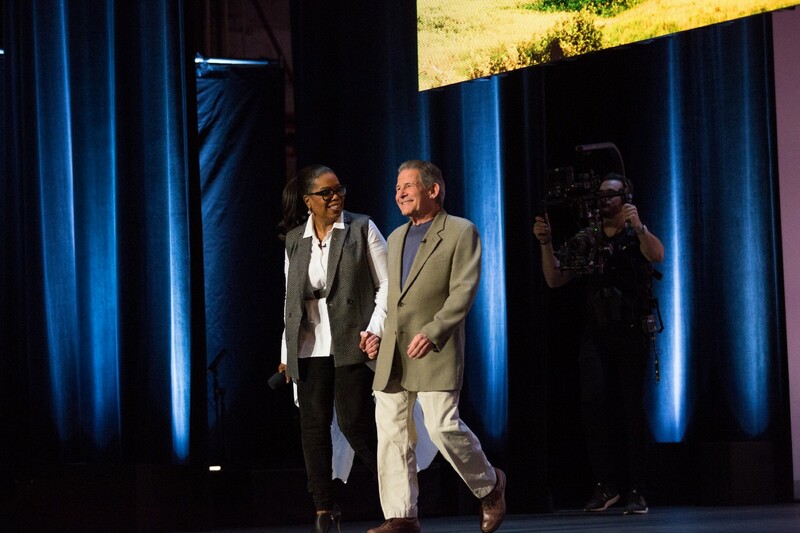 Speaking of Tony Robbins, a master of consciously affirmative thoughts who believes certain things that most people don’t believe, he was one of the eight presenters at Oprah Winfrey’s Super Soul Sessions 3 this past April. Conceived to inspire positive change, the Super Soul Sessions 3 is the third day-long speaker series which consists of 8 sessions exploring spirituality and personal fulfillment. Gary Zukav: Every action, thought and feeling is motivated by an intention. That intention is one with the effect or outcome, because the intention participates with and infuses the outcome. At the root of every intention is either love or fear at its core. Fear reflects the frightened parts of your personality. Encounters that feel uncomfortable are there for your personal evolution. You can look at life from the perspective of the personality or from the perspective of the soul. Authentic power is the alignment of the personality with your soul. Glennon Doyle Melton: How would our lives, relationships and world change if we stopped being afraid of pain? We don’t need people in our lives who can fix our pain. We need people who can be with us and be still with pain. Our collective pain can become our collective power. There is no glory except through your story. First there is pain, then there is rising. Wes Moore: There is a difference between your job and your work. Job=occupation and work=passion overlapping with the world’s greatest needs. Our work is the journey and the very personal process of uncovering what makes our heart beat a little faster. Your work is not someone else’s work. If your work is to help end something, the people you are trying to help should be a part of the conversation not just subjects of the conversation. We are all products of our expectations. 1. Take your “hands off the wheel” through prayer. Forget what you think you need. 2. Focus on what’s already thriving. 3. Obstacles are detours toward the right direction. 4. Ask for a sign. Pastor John Gray: All of us come from somewhere, and from some perspective but if we bridge the gap we can meet in the middle. If we’re both in this middle place, we can be relational, relatable, relevant, intentional and even uncomfortable, just as long as we begin the conversation. Angela Davis: “If it doesn’t challenge you, it doesn’t change you.” As a member of the USA Track and Field Team, Angela held world rankings at the 100m. She was an Olympic Trials semi-finalist and a member of the World Championship team. She’s now an instructor at Soul Cycle and takes spirituality and exercise to a whole new level. For those of you unfamiliar with check out Ryan Overhiser’s humorous and spot-on recount of his first time participating in a Soul Cycle class. Tony Robbins: Filled with mind-boggling enthusiasm and up-leveled energy, Robbins held the attention for more than one hour while he delivered psychological tools and strategies on how to create an extraordinary quality of life. Prior to this event, I had not seen Robbins live. I can now understand why someone would fly to the east coast to attend one of his seminars, and try to walk across a bed of hot coals. After a session with Robbins, you feel like there is absolutely nothing that you can not accomplish. His session was incredible. I highly recommend that you watch the full session (below) as it will be available for a limited time. In the end, when it’s all said and done, the information presented at the Super Soul Sessions is for you to do something with what you’ve learned and insights you’ve gained. That’s how you know it’s time to change the way you look at things.